Having a family history of diabetes, being overweight or obese, and lack of physical activity can all figure into type 2 diabetes risk. Now it appears that eating patterns—how many times per day a person eats, snacking habits, and eating breakfast—may also be a factor in diabetes risk. 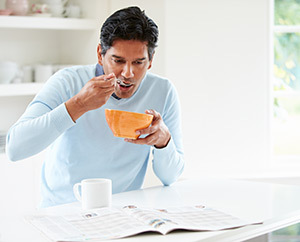 Men who regularly skipped breakfast were 21% more likely to develop type 2 diabetes compared with men who ate breakfast. Men who ate one to two times per day had 25% higher risk of developing diabetes compared with men who ate three times daily. Men who skipped breakfast and ate one to three times daily had a higher type 2 diabetes risk than men who ate breakfast and ate one to three times per day. Additional daily snacking beyond three main meals was associated with higher diabetes risk, but only in overweight and obese men. Skipping breakfast may be associated with an increased risk for type 2 diabetes, regardless of how many times a person eats each day. In addition, skipping breakfast may set us up for eating just once or twice daily, another habit that may contribute to higher diabetes risk. Lots of snacking may be a problem too, but only if you’re carrying excess weight. Although these findings don't prove that missing breakfast is a cause of diabetes, it does suggest that breakfast may have an important role to play in keeping us healthy. Make it snappy. Many folks feel there’s no time for breakfast, but a little preparation goes a long way. Make a big batch of whole or steel-cut oats and keep them in the refrigerator so they can be quickly warmed and eaten with fruit and a few nuts or seeds in the morning. Alternatively, having a few peeled, hard-boiled eggs on hand makes it easy to grab breakfast and go—just remember to take a vegetable or a piece of fruit with you, too. Be a smooth operator. Breakfast smoothies can help you get in some extra fruits and vegetables without having to spend extra time. Try blending a banana, some frozen berries, and a leaf or two of spinach, kale, or other greens into a base of unsweetened yogurt, soy or nut milk, or cow’s milk. A few nuts, a slice of avocado, or a spoonful of nut butter will make it taste rich and help keep you full until your next meal.